This DIY is so easy and probably couldn't get any cuter! I'm keeping my magnet board in the kitchen for any recipe cards that I may be using or to rotate pictures in and out without having to use a dedicated frame. 1. Begin by removing the glass from the picture frame. 2. 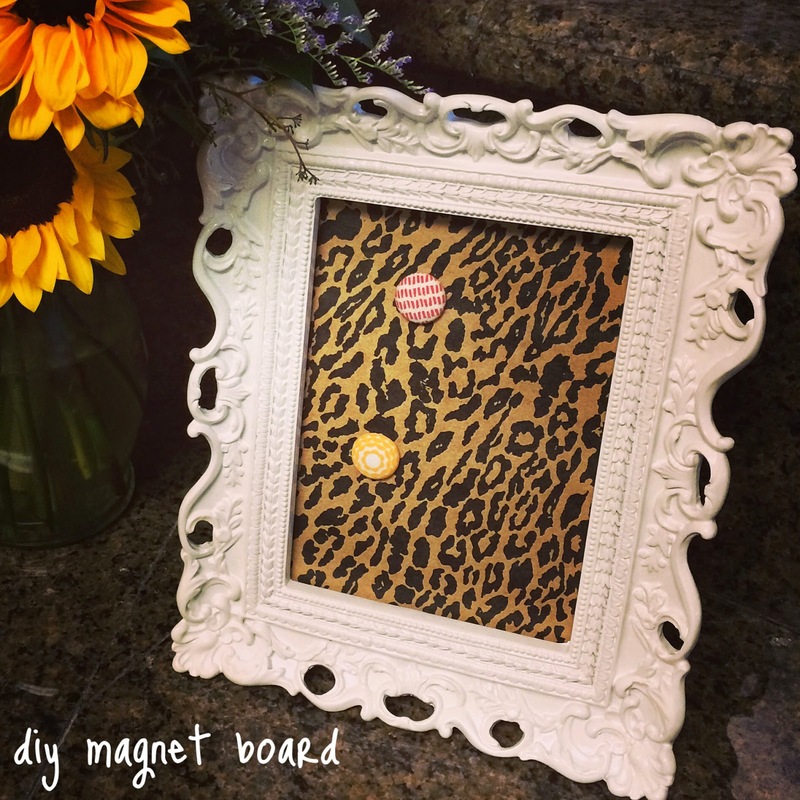 Next, use an adhesive magnet and stick the magnet to the decorative paper. If your frame is an 8x10, you may need to use more than one magnet sheet. 3. Cut around the magnet to remove the excess paper. 4. 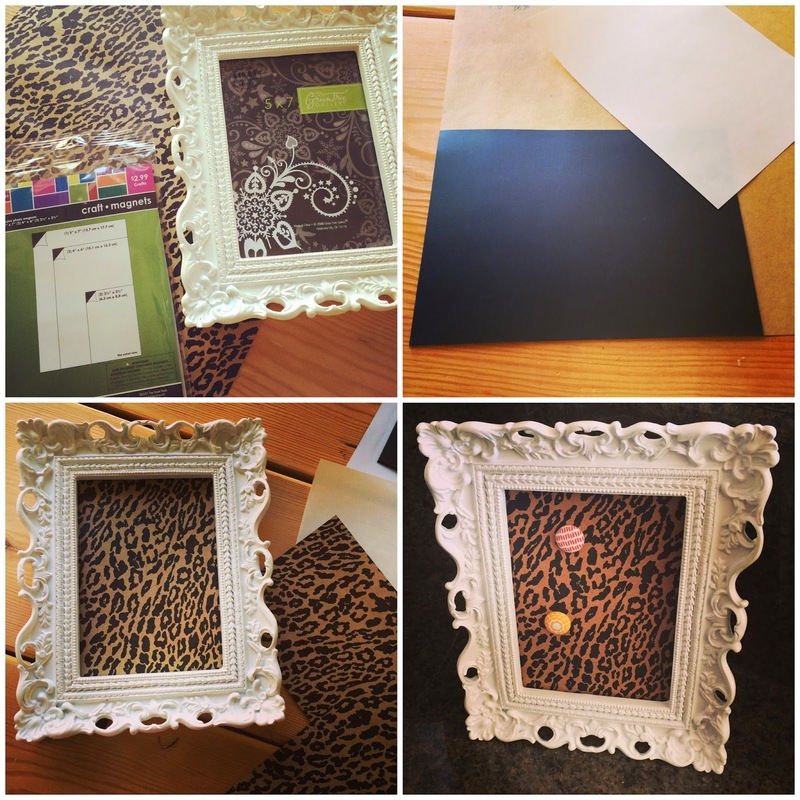 Place the decorative paper into the picture frame. When choosing your magnet sheets, pay attention to the level of magnet (I used a level 2 and it worked great, but level 1 may have been a bit to weak to hold up a recipe card). Happy 4th of July tomorrow!! Anyone have any fun plans?! John and I plan to hang around town and maybe do a bit of exploring... nothing too extreme, but just how this kind of holiday should be spent! How cute is that! Love the idea, and love that you can just switch out the paper to get a different look if you want! This is so pretty! I love the print you chose - this would be perfect in my kitchen! I love this! I made one of these a few months back and I am dying to make more. So simple and so useful! This is so cute!! I can totally make this and not screw it up!! thanks for sharing and have a great weekend! So cute and easy! You could even add a laminate over the decorative paper so it could easily be wiped down in the kitchen. . . I would clearly need that if I was doing any cooking that close to something that cute! Such a cute idea!! I didn't know they had such a thing as magnet sheets! Have a great 4th!! You had me at leopard hah. This is so cute and Hobby Lobby is definitely my go-to already. Happy 4th, lady! SOOO cute!! I didn't even know they made magnet things like that! This is super cute... and super easy! Flash giveaway @ my blog - today only! This is such a good idea! I wish we had more counter space in our kitchen because this would be perfect to put up little recipes and other things! this is so cute! my mother in law has a fridge that magnets dont stick to (?!) so i might make this for her birthday... fabulous! Love love love this!!! I have a big chalkboard that looks similar that we used for our wedding. Making one of these would match perfectly with it! Why does everything look so fabulous in leopard print?